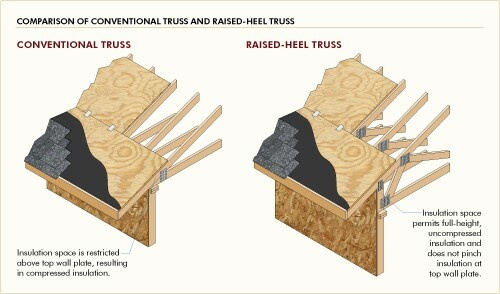 Raised-heel trusses, also known as energy-heel trusses, deliver cost-effective energy performance. Insulation can increase a home’s energy efficiency, but only if it’s properly installed. Batt insulation installed as per manufacturer instructions should perform at its stated value, but R-value can decrease if it’s compressed in tight spaces. In roofing assemblies, conventional trusses can restrict insulation space above the exterior wall top plate, resulting in compressed insulation. 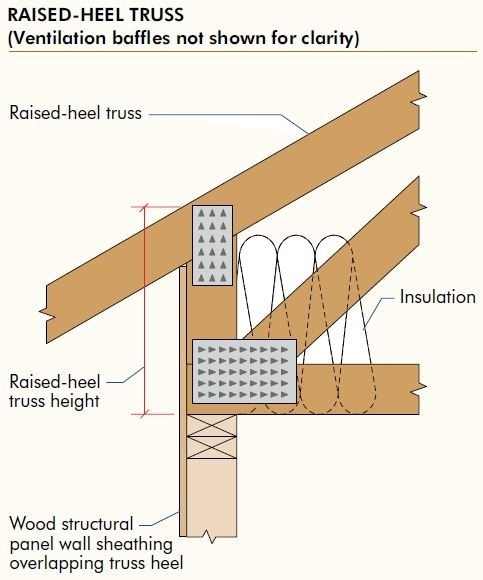 Raised-heel trusses can provide a significant boost to the insulating power of a home. Raised-heel trusses, also known as energy-heel trusses, deliver cost-effective energy performance, especially when used with continuous plywood or oriented strand board (OSB) . According to an energy modeling study conducted by Nexant Energy for APA – The Engineered Wood Association, homeowners can save, on average, 4 to 6 percent in energy costs annually. This is because raised-heel trusses provide improved access to hard-to-insulate areas, permit full depth insulation throughout the attic, and result in superior energy efficiency. A raised-heel truss is identical to a conventional truss except it is raised higher, with a “heel” that extends up from the top of the wall and elevates the truss where it meets the exterior wall below. This heightened truss creates space that permits full-height, uncompressed insulation that cannot be pinched at the top wall plate. Installing a raised-heel truss is similar to installing a conventional truss, making the transition for a builder virtually seamless. Uplift resistance can be added to the roof framing by anchoring the trusses to the top plate through the nailing of continuous wood structural panel sheathing or the use of metal connectors fastened directly to the raised heel portion of a truss, provided the top plate is anchored to the members below with continuous wood structural panel wall sheathing. For other wind or seismic categories or raised-heel truss depths, consult the IRC, IBC, or APA System Report SR-103: Use of Wood Structural Panels for Energy-Heel Trusses. Framing with raised-heel trusses and continuously sheathing exterior walls improves structural and energy performance, and offers many savings that benefit both the builder and the homeowner. This approach to framing eliminates the need for blocking, minimizes air infiltration, and creates a stronger building envelope by enhancing the connection between the wall and the roof. More insulation with better coverage eliminates cold spots at the top of exterior walls that conventional trusses otherwise create. Homeowners will immediately feel the impact of a more comfortable, energy-efficient home. Builders will be confident that they are maximizing the energy efficiency of the homes they build.